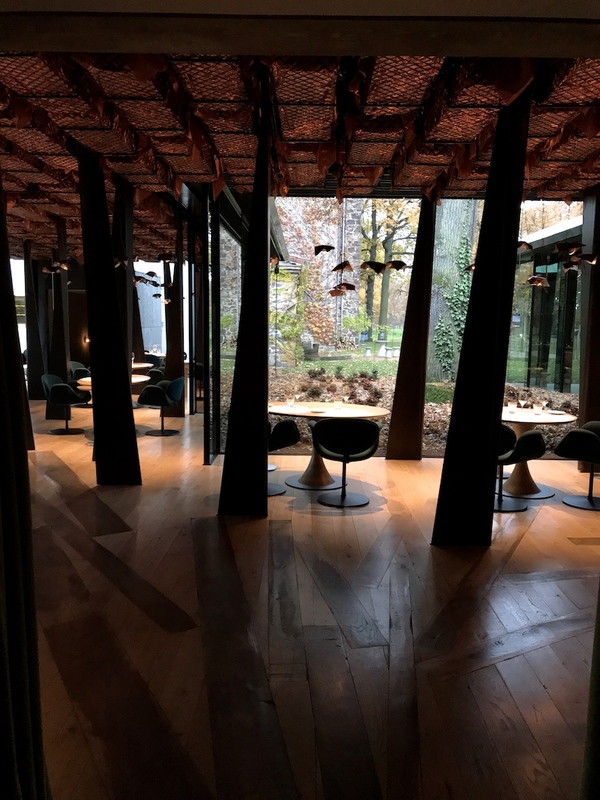 Maison Troisgros ("Troisgros") is a 4th generation family-run hotel and restaurant, originally established in Roanne, France, but since early 2017 relocated to a rather spectacular new, 17-hectare "domaine" in Ouches. 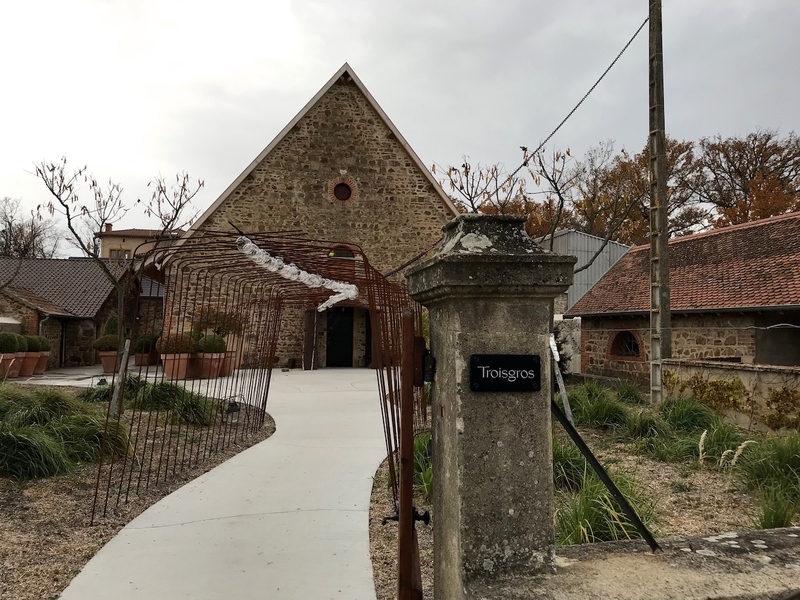 The first few glimpses of this new location in the Loire countryside were shown in the Chef's Table France's Troisgros episode, a Netflix series that was released in 2016, and an episode that ends with three generations of Troisgros chefs (Pierre, his son Michel, and Michel's son César) walking arm in arm through the grounds of the new location in Ouches. Troisgros has a long and illustrious history. Founder of the hotel and restaurant was Jean-Baptiste Troisgros (b. 1898 - d. 1974), a restaurateur who bought the original Troisgros property in Roanne in 1930, then called l'Hôtel des Platanes. Shortly after, the hotel was renamed Hôtel Moderne and Jean-Baptiste's wife was in charge of the kitchen. However, Jean-Baptiste was very much involved in finding good produce and he had a keen interest in wine. The restaurant had an excellent reputation, but things really took off when Jean-Baptiste and Marie's sons Jean (b. 1926 - d. 1983) and Pierre (b. 1928) took over in the kitchen. This was in 1952, when the Troisgros brothers returned to Roanne, after training in the kitchens of Lucas Carton in Paris and Fernand Point's La Pyramide in Vienne. In 1953 the restaurant was given the Troisgros name (Les Freres Troisgros). 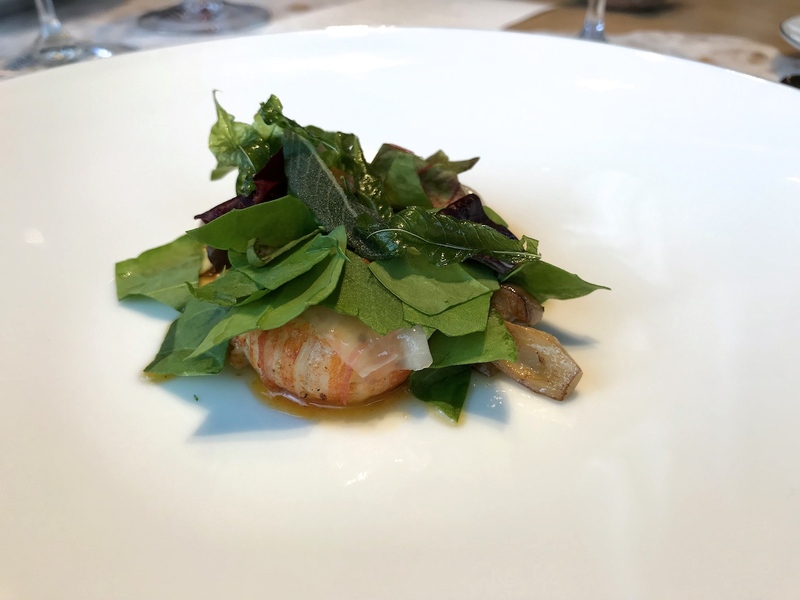 Two years later they received their first Michelin star, and the second star followed ten years later in 1965, not long after the invention of the legendary "Saumon à l'oseille" dish (1962, salmon with a creamy sorrel sauce). In 1968 Les Freres Troisgros was awarded a third Michelin star, which the restaurant has held ever since. The third star was a complete surprise; Pierre only discovered it when he opened the Michelin guide which he had bought at the local news agent, or so the story goes. Jean-Francois Mesplède quotes Pierre Troisgros in his book "Trois Étoiles au Guide Michelin" as saying: "it's a catastrophy, we've barely started". Everyone was in a state of shock, and in the same book Jean-Baptiste is quoted as having said: "we were given these stars for what we were $.... we will not change a thing." As you can see, even in those days Michelin stars weren't always an instant blessing, but luckily handing back stars wasn't a thing in those days, and the three Michelin stars put Les Freres Troisgros even more firmly on the gastronomic map. What they gained even greater notoriety for however, was for being leading members of the Nouvelle Cuisine movement, that pushed for a lighter and more elegant haute cuisine, a movement that took France by storm in the late 60s and the 70s. Jean and Pierre Troisgros' reign came to an end quite abruptly, when Jean Troisgros died unexpectedly of a heart attack in 1983. Jean's death left Pierre in charge of the kitchen, but not long after he was joined by his son Michel (b. 1958), who had started his career at the early age of 16, working in some of the world's finest kitchens, including Roger Vergé's 3-star Le Moulin de Mougins in Mougins, Alain Chapel's eponymous 3-star restaurant in Mionnay, Michel Guérard's 3-star Les Prés d'Eugénie in Eugénie-les-Bains, but also at Chez Panisse in the US. Pierre Troisgros retired in the mid nineties and since 1996 Michel and his wife Marie-Pierre have been in sole charge of the restaurant and hotel. Michel Troisgros successfully led the restaurant into the 21st century, even making the San Pellegrino's World's 50 Best Restaurant list in the 00's, entering the list at number 24 in 2006 and that same year the Troisgros family also opened their first restaurant in Japan at the Hyatt Regency in Tokyo, currently awarded two Michelin stars. As with any family business, involving the next generation is key. Michel and Marie-Pierre are very much involved in the day-to-day operations of the flagship in Ouches, but effectively in charge of the kitchens today, is their eldest son César (b. 1986). Michel is still making his rounds around the tables in the dining room, but in the kitchen the team answers "Oui Chef" to César. Father and son have been working alongside each other since 2012, when César returned to Roanne after training at some of the world's leading restaurants, including El Celler de Can Roca in Girona and The French Laundry in Napa Valley. So, new location, new generation, time for a revisit. Troisgros is open for lunch and dinner Wednesday through Sunday and you can choose between a seasonal/monthly tasting menu for €270 (around 9 courses) or the a la carte menu, with dishes priced between €75 and €110. On weekdays the restaurant also offers a lunch menu for €150 (around 4 courses with matching wines), but according to their website there's limited availability for this menu and it has to be booked in advance. 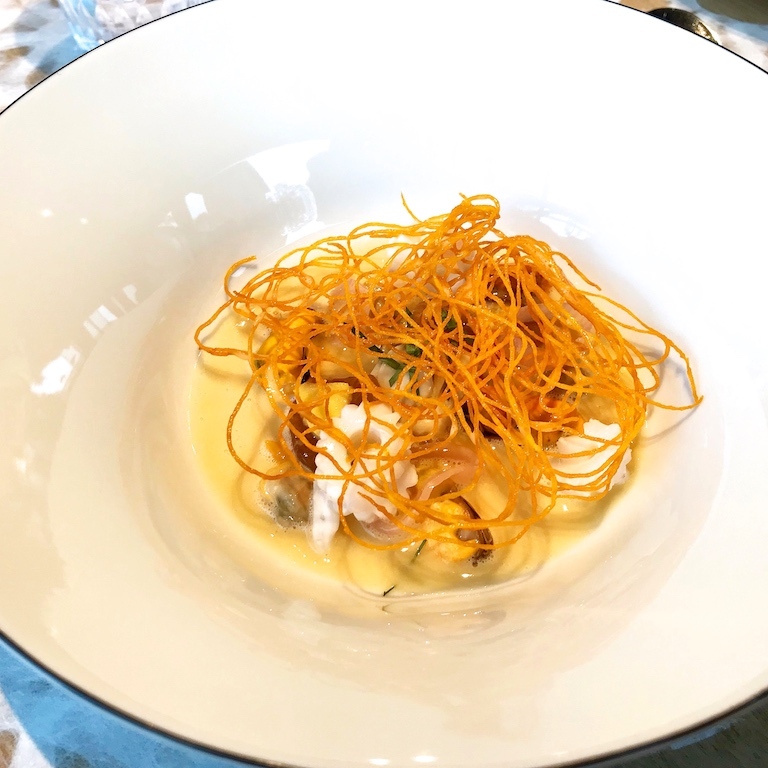 I had lunch with my husband at Troisgros in November 2017 and we both ordered the seasonal menu. Lunch started with a snack to share and a buckwheat brioche. 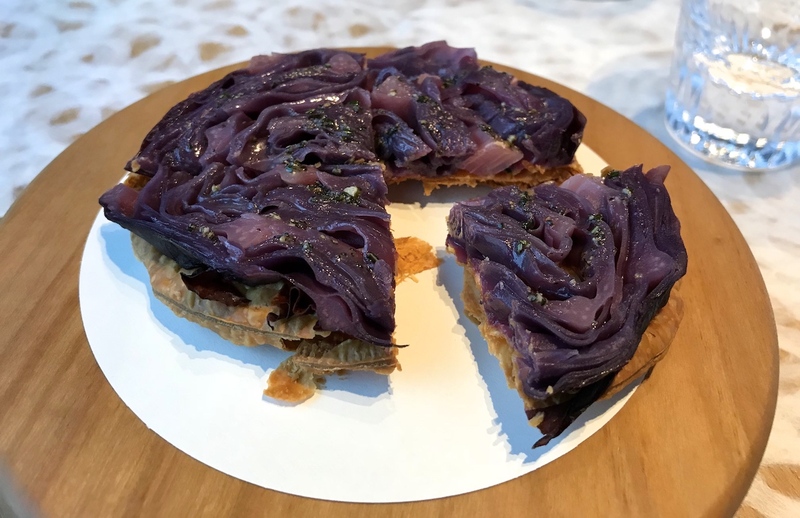 The snack was a puff pastry disc topped with sharp mustard, a slice of tender red cabbage, and a salsa verde-like dressing. An unexpected, although not uncommon flavour combination, that delivered a nice sweet and sharp flavour experience, and the pastry was wonderfully crisp. First course of today's tasting menu was a light and creamy milk crème, set like a curd, with some toasted buckwheat on top, and paired with a little bundle of coarsely grated soft squash and Oscietra caviar. 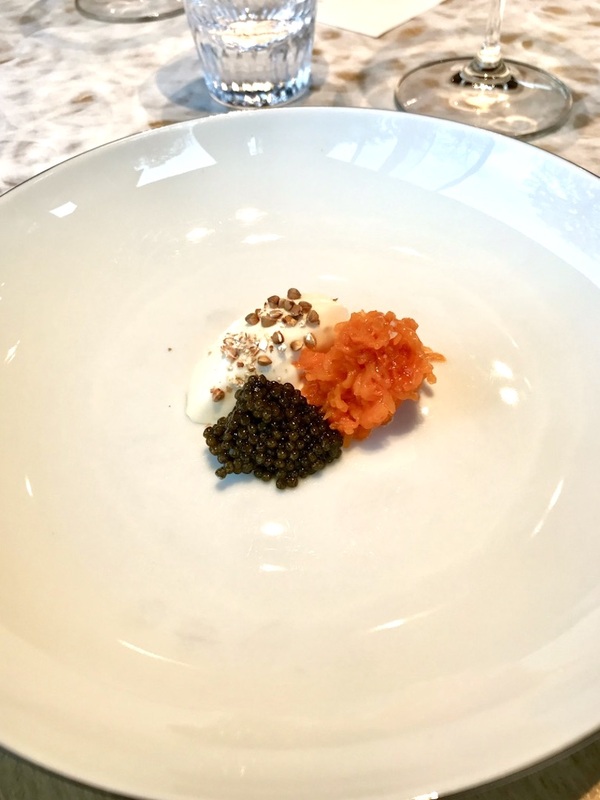 A lovely pairing, the sweetness of the squash working well with the saltiness of the caviar, and the milk crème adding a lovely smoothness to the dish. This was followed by a seafood dish, somewhat comically described on the menu as "Mussels in drunkenness". Hiding underneath some deep-fried, spiralised sweet potato, was a mixture of cockles, mussels, an oyster, a few pieces of nicely curled up squid, pickled shallots, fresh ginger, and crushed pepper berries, around which mixture a concentrated white wine (Rancio) sauce was poured. The sauce, which had a lovely butteriness to it, packed a real punch, and surprisingly didn't overpower the seafood, but only just. All the individual flavours of the seafood came through nicely. The seasoning of fresh ginger and pepper berries was quite powerful, especially the sharp ginger, but the latter did balance the richness of the sauce. 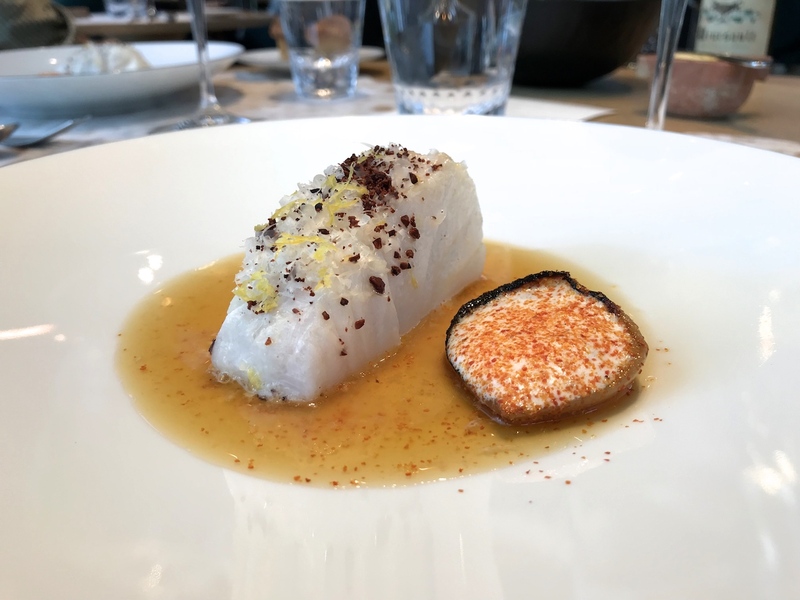 Third course was a piece of immaculately cooked cod, seasoned with crushed cocoa solids, grated Parmesan cheese, and lemon zest, served with a concentrated tomato broth flavoured with cocoa, and a grilled onion shell filled with a light Parmesan cheese cream, dusted with a concentrated tomato powder. Parmesan and chocolate are quite the oddball pairing (although scientifically proven to work), let alone pairing it with cod. Obviously, flavourwise there was a lot going on on this plate, but somehow the flavours worked. The quality of the cod was phenomenal and it could take on the fruity bitters of the cocoa. The Parmesan and tomato enhanced the cocoa flavours nicely, making for a fun, umami-rich flavour experience. But it was fun rather than profound, and I don't think that I would order it again. 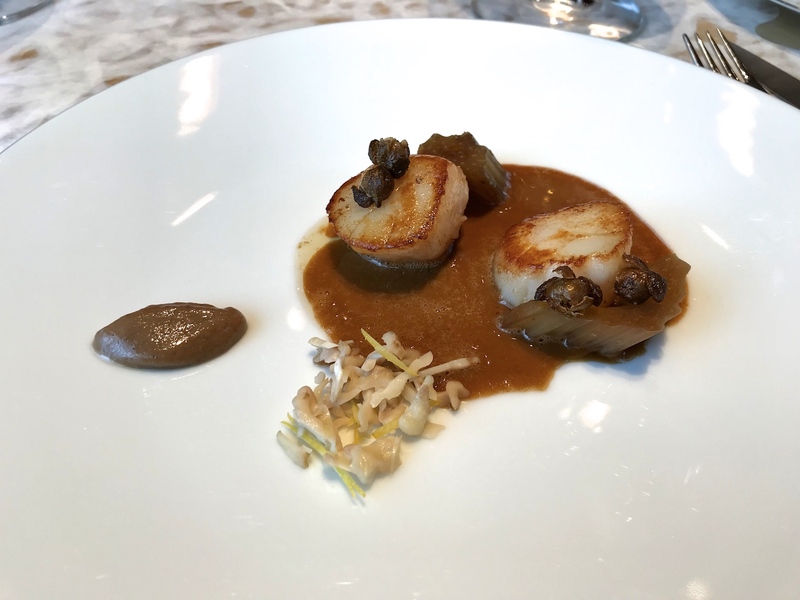 Next up were scallops served with capers, braised cardoon, fresh walnuts, walnut puree, and a rich and acidic cardoon reduction, seasoned with a touch of lemon. Essentially not a bad dish, but if anything, this dish was more about contrast than harmony or complexity. The flavours were bold and lacked finesse. Fifth course was crayfish covered with some thinly sliced lardo, and served with mushrooms, herb butter, and lots of leaves, mainly sorrel. Wonderfully plump and juicy crayfish, the lardo adding a nice smokiness, and a nice touch of comfort coming from the herb butter. But there were too many sour leaves, which unbalanced the dish. In the end crayfish don't have enough fattiness to take on that much sourness. The meal continued with two superb pieces of venison, but unsuccessfully paired here with a green curry sauce, seasoned with ginger and lemongrass. Curry sauces can work incredibly well with game, but here it was a total misfire. The spices had not melted into the sauce, leaving a powdery sauce that was lacking smoothness, and it had an acidic finish. Borderline unpleasant. Also on the plate was some pickled onion, charred onion, braised fennel, and pomegranate seeds. All nice enough, but in the end not making for a refined plate of food. Before dessert there was cheese. The selection at Troisgros was nice enough, but the staff was a bit reluctant to share details about the individual cheeses on the board. Seventh course and first dessert was a puffed rice cream, with some finely diced ginger mixed through (and seasoned with a touch of yuzu? ), accompanied by sake ice cream, marinated grapes, and covered with a milky cream veil. There were some nice elements on the plate, especially the puffed rice cream and the sake ice cream, but the ginger was a dominant flavour, especially in the finish. 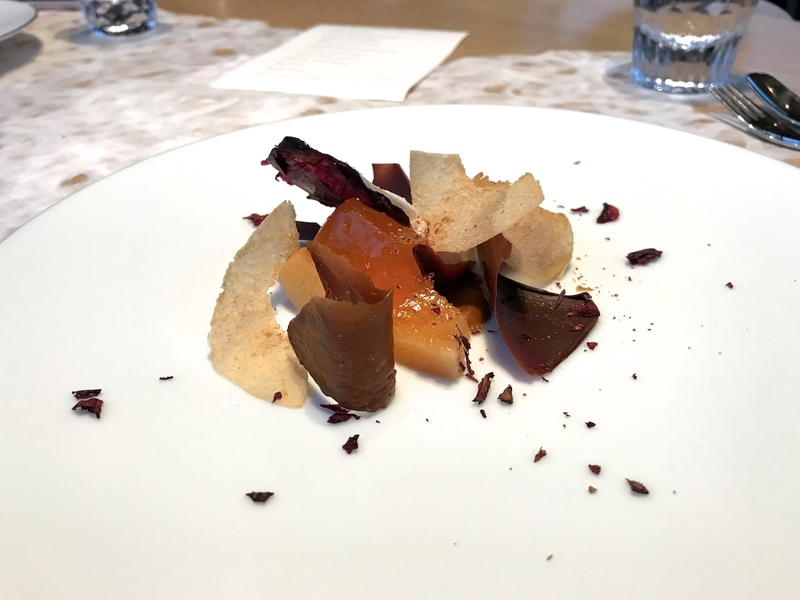 The second dessert called "Autumn Leaves" was more convincing, the leaves including a dried quince skin "leaf", chocolate leaves, and a sugary quince leaf, served with quince jelly, quince ice cream, and finished with a seasoning of freshly grated cardamom, cocoa powder and salt. A pleasant, not too sugary, dessert and I liked the different textures/preparations and flavour intensities of the quince. Carrying a family business to the 4th generation is no small feat. Statistically 70% of generational business transfers go wrong, so only 9% of all family businesses make it to the third generation, let alone the fourth. In the Chef's Table episode Michel revealed that working alongside his father wasn't always easy and that they had had more than their fair share of arguments and disagreements. Even though there is always the legacy to consider, every new generation wants to write its own story with its own creative freedom. In Michel's case this even meant taking the "sacred" salmon and sorrel dish off the menu for years, so that he could make his own mark. And he did. 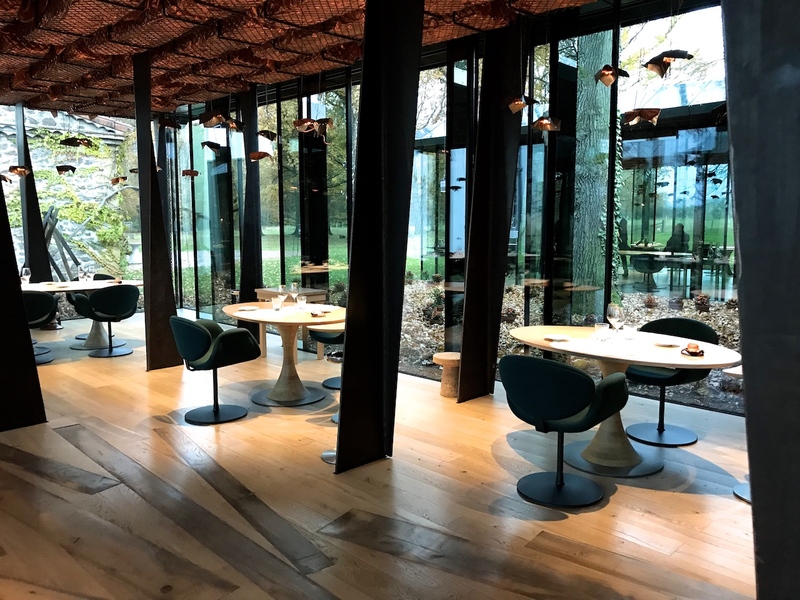 By moving their flagship restaurant from Roanne to the new premises in Ouches, the Troisgros family have invested in the current and future generations of the family and the "Maison". The new location is spectacular and breathtaking, by any measure, but at the end of the day the final judgment is about the food and it was disappointing. Troisgros has always been celebrated for its cutting-edge flavours, with innovative flavour and texture combinations, a winning and captivating synthesis that challenges and excites the senses, and it made me award the restaurant 99/100 in my 2012 review. Innovation is an endless quest and today's dishes and flavours were certainly innovative, but they were mainly interesting rather than brilliant. Looking at today's dishes you get the impression there's been a significant change of direction. 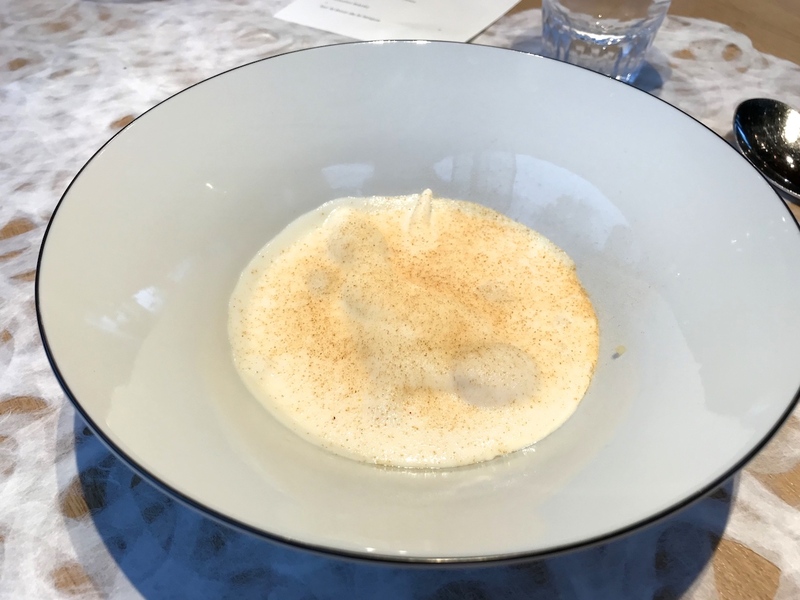 The seasonal (November) menu was centering around powerful (eg the scallops and the venison), and sometimes experimental flavour combinations (eg the cod), and overall the experience didn't release the wave of pleasure I had been hoping for. Particularly the crayfish and the venison weren't exactly a feast for the tastebuds. Moderation and balance were perhaps the missing ingredients today. 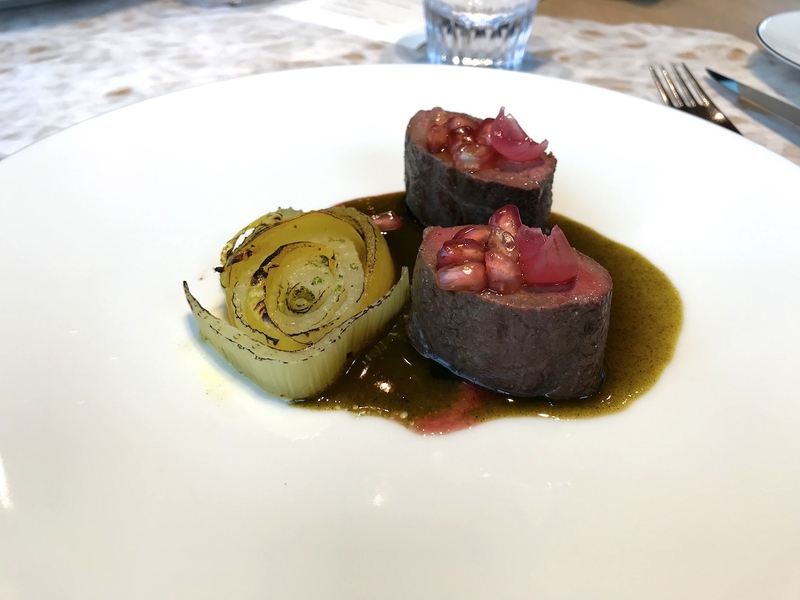 At the moment, the high level of excellence in the Troisgros kitchen is only visible through the first-rate ingredients and the meat and fish cooking skills. On balance, this makes me give a 89/100 score to Troisgros. The new location is absolutely worth the journey, but at present the food is not.